Happy Sunday! All of the pretty things this week are one color. You've probably heard that yellow is the new 'millennial pink' and it really is growing on me so much. I especially love a particular shade which I can only describe as buttercream. It's the color of Kiehl's Creme de Corps or a whipped egg yolk. Solid & Striped is the go-to swimsuit brand these days, isn't it? I love their sporty silhouettes, especially when it comes to this retro-inspired bikini top and high-waisted bottoms. I've always loved the Chloé Lauren scalloped flats, but I think I might actually like these platforms even better! They'd be such a cute addition to any spring/summer outfit. One of the best night creams I've ever tried is the Omorovicza Rejuvenating Night Cream. It's incredibly luxurious and gives your skin such a hydrated, refreshed look overnight. The Lala honeycomb-crepe dress from Emilia Wickstead is such a great blend of prairie inspired looks and minimalist pastels. I love the idea of pairing this with the Chloé platforms for a monochromatic look. 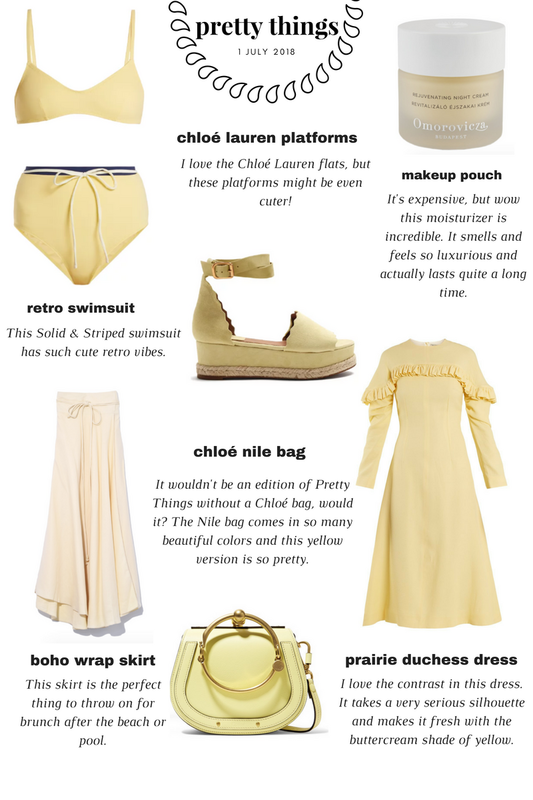 Like I said in the graphic, it wouldn't be Pretty Things if I didn't include a Chloé bag. I'm so obsessed with the Nile bag specifically and love it in the buttercream shade. It's such a delicate color and would look so pretty with blue denim or an all-white look. This boho skirt from Apiece Apart is so good. It's flowing but has a fitted waist, which is such a flattering silhouette. I imagine putting this on with a tank top or t-shirt after leaving the beach/pool and going out for brunch.